Put the plate in the fridge. Fill the canning pot about 1/3 - 1/2 full with water, add the rack insert, put on the lid and set the water on to boil. The low sugar pectin package should come with two pouches of powder - the small one is calcium and the large one is pectin. Using the small jar with the lid, add 1/2 teaspoon of calcium powder to 1/2 cup of water, screw on the lid and shake to dissolve. Wash and de-stem or pit the fruit. Measure about 12 cups of fruit into the large pot. Turn it on medium heat and bring to a boil, stirring occasionally. Use the potato masher to squish the berries up. In the mean time, put the jars into the canning pot and boil them to sterilize them for about 10 minutes. You may need to do this in two batches. Put the lids in the bowl that can hold boiling water and cover with boiling water. Set aside. In the smaller pot, bring the fruit juice to a boil and then pour it into the blender. Add 8 teaspoons of pectin powder. Blend for 1-2 minutes, or until the pectin is well blended. Use a spatula to scrape down the sides. Use the tongs to pull the jars out of the boiling water. Drain and have them ready. Add the lemon juice to the cooking fruit. Shake the jar with the dissolved calcium powder and add 8 teaspoons of the water to the fruit. Pour the fruit juice-pectin mixture into the hot fruit. Bring it to a rolling boil and cook for 1 minute. Turn off the heat. 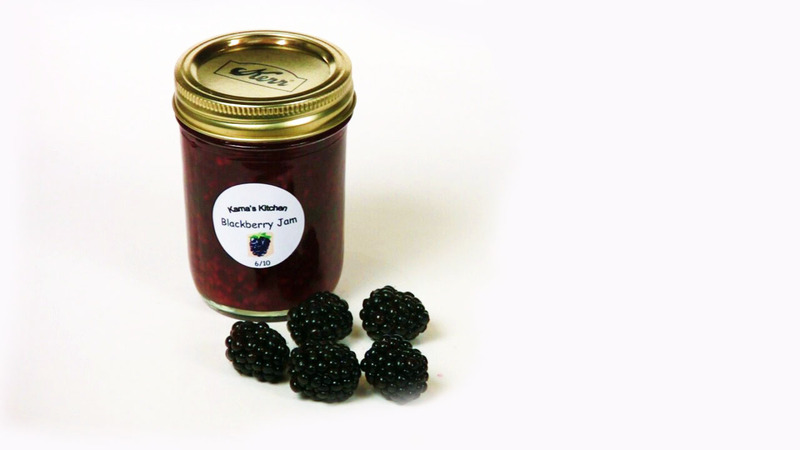 Taste the jam and add some agave nectar if you want it a little sweeter. Just a warning: fruit sweetened jam isn't nearly as sweet as what you may be used to. Test the jam to make sure it will gel. Pull the plate out of the fridge. Use the spoon to put a dab of jam on the plate and return it to the fridge. If it sets, then you’re set! Low-sugar jam doesn't fully set until it is completely cooled. Insert the funnel into a clean jar. Ladle the jam in to about 1/4 inch from the rim. Use the towel to wipe away any drips around the rim – it has to be clean for the seal to work. Put a lid on and screw on the top. It should be tight, but not so tight you can’t unscrew it. Prop the rack insert up on the rim of the canning pot. Place the jars in the rack and carefully lower the insert into the boiling water. The jars should be completely covered with water. Put on the lid and let them boil for 10 minutes at sea level, adding 1 minute for each 1000 feet of altitude. Remove the jars by pulling the insert up and grabbing each jar with tongs. Let them cool. You’ll know when they are sealed when you hear a little ping noise. You can also test by pressing on the middle of the lids: if they stay put when you press on them, they are sealed. *Strawberries, blackberries, raspberries, blueberries, marionberries, cherries, apricots, peaches, gooseberries, currants, plums, boysenberries, loganberries, huckleberries. Label the jam with the type and date just so you don’t forget! And if a jar doesn’t seal, then that’s that’s the one you get to eat first!